Following Tobacco companies malfeasance, Pharmaceutical companies’s misconduct is under the spotlight with congressional hearings on the cost of drug prices and allegations of the industry’s role in the opioid crisis. When in 2018 the FDA wanted to approve a drug called Dsuvia, a formulation of sufentanil that Brown describes as a “very potent” opioid compound that is “500 times more potent than morphine,” the FDA head, aware that Brown would try to block the approval of this potent opiod, conspired to get the measured passed when Brown was absent. Despite many politicians, particularly declared presidential candidates, beginning to speak out against big or bad or big bad pharma, Brown does not think that anything will come out of it “because Congress is owned by pharma,” he claims (Ibid). 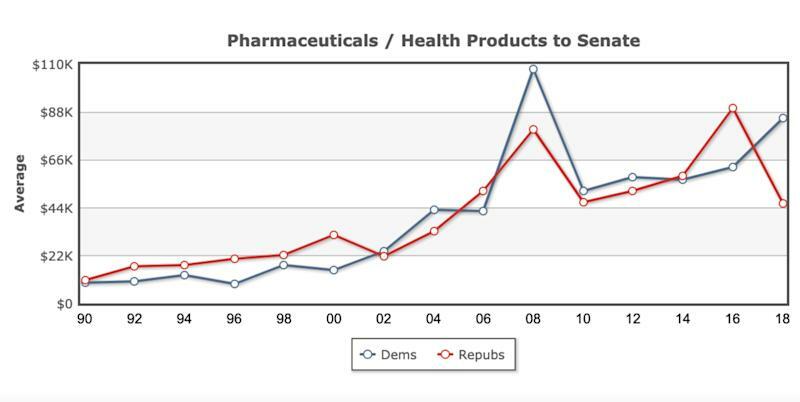 Top: Contributions from the pharmaceutical and health products industry during the 2017-2018 election cycle. Paul Ryan (R-Wis.), the former speaker of the House, was ranked 10th among members of Congress. He received $222,070, seeing most of the funds coming from Merck. Fourteen out of the top 20 recipients in the House were Republicans. Beto O’Rourke (D-Texas), a former congressman who almost upset Senator Ted Cruz (R-Texas) in the 2018 midterms, was 18th on the list. O’Rourke, seen as a potential 2020 Democratic presidential candidate, received $171,255. In the Senate, notable names include Orrin Hatch (R-Utah), Kirsten Gillibrand (D-N.Y.), and Senate Majority Leader Mitch McConnell (R-Ky.). Hatch received $238,289 in donations, with Merck being the biggest donor among manufacturing companies. McConnell, ranked 12th among senators on the list, received $149,113, with Eli Lilly being the prevailing big pharma company. 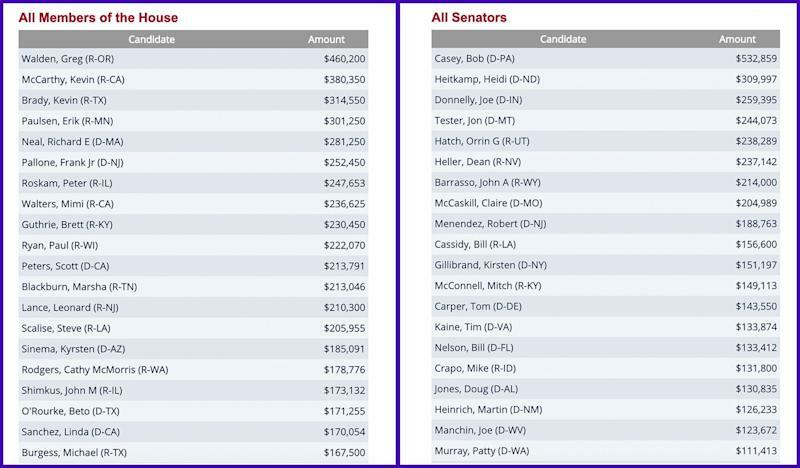 Fifteen out of the top 20 recipients in the Senate were Democrats. Gillibrand, a Democratic candidate for president in the 2020 election, was ranked 11th on the list. According to OpenSecrets, Klobuchar received $65,491 in campaign funds during the 2017-2018 election cycle, with $8,500 coming from pharmaceutical companies. 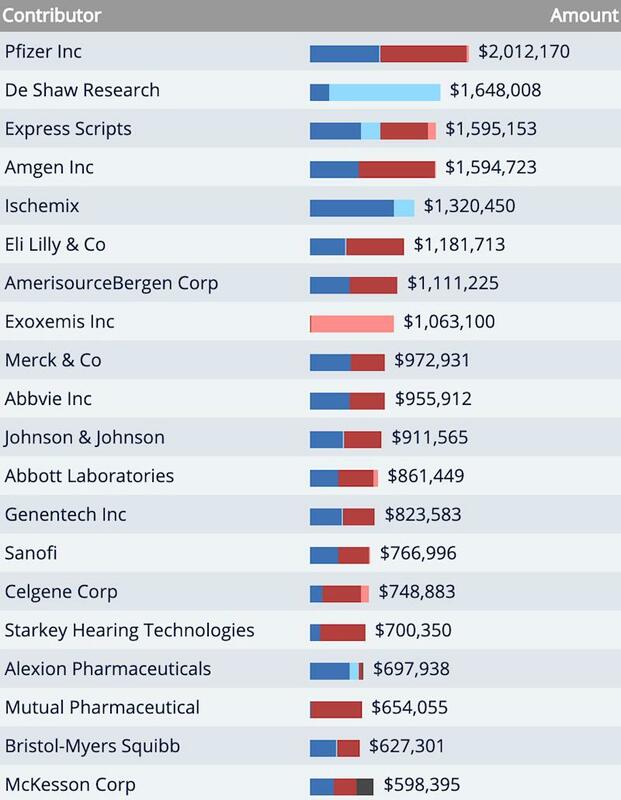 Abbott Laboratories was her biggest pharma donor at $8,000. So its legit to think that Klobuchar may be pretending to be responsible against Pharma’s abuses. Because she did accept the pharma money. As a result of the lawsuits, Purdue Pharma is exploring filing for bankruptcy. Filing for Chapter 11 protection “would halt the lawsuits and allow Purdue to negotiate legal claims with plaintiffs under the supervision of a U.S. bankruptcy judge,” Reuters reported..